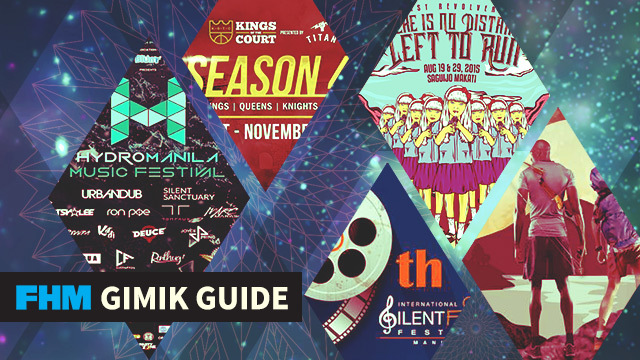 The FHM Gimik Guide: A Hoops League Opening, The Last Revolver Gig, And A Silent Film Fest! Awesome indoor and outdoor activities are waiting this long weekend! Another long weekend up ahead! A week after LeBron James returned to the country, local hoops has been on a high. Despite the erratic weather, passing wiz Ricky Rubio was still able to drop by and #TakeOnManila. Not only Rubio, Fil-Am Laker guard Jordan Clarkson also set foot here this week. And while we're optimistic that he could help our beleaguered national team, Gilas Pilipinas, uncertainty suddenly clouded over our hopes. Thank God we had this pretty traffic stopper, Arci Muñoz and Sarah Lahbati in a leg-baring number, a bikini-clad Kate Upton, and finally, Solenn Heussaff's glorious—yet super bitin—twerking to lighten up the mood. We also had contrasting features on chino and cargo shorts, plain white shirts, and IG style mavens, because these days, men's fashion MATTERS. But you know what matters even more for the next three days? Where to go and what to do this long weekend! Here is this week's edition of the FHM Gimik Guide! WHEN: August 29, 10 a.m.
WHAT'S UP: The 4th season of one of the metro's burgeoning basketball leagues kicks off this weekend, with one game per division (Kings, Knights, Squires, Open) getting underway and a bevy of special prizes and other fun activities in store for attendees. FHM June 2014 Cover Girl and PBA courtside reporter Erika Padilla will also host the event! WHAT'S UP: A downpour of various musical genres await concertgoers in this eargasmic extravaganza. Catch Urbandub, Silent Sanctuary, DJ Ron Poe, and Deuce Manila x Joyce Pring, among others, in this OPM music fest! WHEN: August 29, 7 p.m.
WHAT'S UP: Fancy outdoor activities? Wall climbing, archery, and paintball are just some of the many exhilarating activities in this urban-set Outdoor Expo in Taguig. What a way to spend the weekend! WHAT'S UP: Nine countries will be participating in this silent film showcase—Germany, France, Japan, Italy, Austria, Spain, Thailand, USA, and the Philippines. Several artists and bands (The Dawn, Razorback, Kjwan) will even provide live sounds to some of the featured films in this one-of-a-kind flim festival.